Become a Nashville Native – in Murfreesboro! 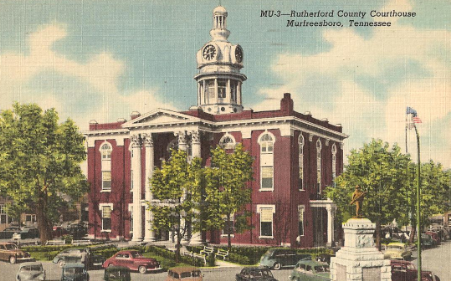 Once hailed as the capitol city of Tennessee (1818-1826), Murfreesboro sits at the geographic “center” of our long, flat state. Home to Middle Tennessee State University (where enrollment rivals that of UT-Knoxville), this bustling city is much more than a bedroom community for Nashville. Sure, there are plenty of chain restaurants and big-name shops to support the local population – but there’s just enough of old Murfreesboro still present to make it a fun day trip from Nashville. This weekend (July 10-12) is particularly enticing – head to town early and you can start your day with breakfast at the City Café, just off the courthouse square. There’s free parking at the City Garage near the courthouse – a few blocks away. This friendly and historic “Meat & 3” is renowned for their lunches (and their freshly baked rolls), but they make a good traditional breakfast, too. They open at 6am – I recommend arriving no later than 7:30 because it gets crowded! After breakfast, take a stroll around the grounds of the Rutherford County Courthouse and enjoy the Main Street Saturday Market – a traditional farmers’ market. Local tomatoes should just be coming in about now, and it’s a sure bet that you can find corn, cucumbers, beans and peaches – along with fresh baked goods and lovely flowers. (Plan ahead and put a cooler in your vehicle to store your purchases while you linger in “the ‘boro.”) The market runs from 8am – noon each Saturday from June through August. As the day heats up, so does the fun – after dropping off your farmers market purchases in your vehicle (and picking up your folding chairs), you can walk over to Historic Canonsburgh Village, where Uncle Dave Macon Days will be in full swing. Named for the King of the Banjo and one of the first stars of the Grand Ole Opry, this event has grown from an afternoon banjo-pickin’ contest into annual 3-day music and artisan festival that celebrates old-time music and dancing. If you go on Saturday, you’ll have missed Friday’s Harmonica, Dulcimer and Jug Band competitions – and you’ll also miss seeing Dr. Ralph Stanley perform. (He’s scheduled to take the stage on Friday at 8 pm.) But you’ll get to see the Buck Dance and Clogging finals, and hear the Fiddle, Banjo Competitions, and see the finalists perform in the Bluegrass Band and Old Time Band competitions. You’ll also get to hear The Steeldrivers, who take the stage at 8 pm. Plan on eating festival food for lunch and dinner, or take a break from the heat and visit one of the local restaurants within walking distance. Visit the local services tents to learn what community agencies are active in Rutherford County – one of these tents is sure to be giving away cardboard fans, which are a blessing on a hot July day! Tickets for Uncle Dave Macon Days are $10/day for adults (3-day pass for $20), $5/day for seniors (age 55+) at the gate; children 12 and under are admitted free. Folding chairs are welcome. I can pretty much guarantee that, after enjoying a hot summer day of fun in Murfreesboro this weekend, you’ll drive back home happy, hot and tired, and feeling like you’ve earned your “Nashville Native” badge!